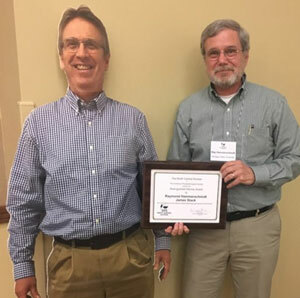 Jim Stack of the plant pathology department was recognized by the North Central Division of the American Phytopathological Society in a team award for the Distinguished Service Award. Recognized along with Stack, was his colleague Ray Hammerschmidt of Michigan State University. Together, Stack and Hammerschmidt have led the National Plant Diagnostic Network since its inception, soon after the tragedies of 9/11. The nomination noted, Stack and Hammerschmidt, "have provided the yarn that has knitted the network together through periods of expanding and retracting resources. They have been influential nationally, but especially in the APS-NCD. It is telling to me that Drs. Stack and Hammerschmidt are looked to by the other Regional Directors for guidance and leadership. Decisions are often deferred until all are sure that their opinions have been considered … Things simply do not happen unless Drs. Hammerschmidt and Stack were behind the scenes, making them happen. When additional subawards are needed, Dr. Hammerschmidt was the best way to get it done. When an interface was needed with APHIS administrators, Dr. Stack was adept at working through his contacts at PPQ-CPHST. These two colleagues are the best reason that NPDN is successful today!" Members of the department are honored to have a colleague on campus with such dedication to biosecurity and are pleased to see his leadership recognized by others across the region. Though Stack was unable to attend the award presentation due to a previous commitment, his friends from K-State made sure his presence was known.